So, the biggest day of your whole life is coming up and you’re thinking of getting married in Las Vegas. It’s a pretty great choice, to be honest, and over 80,000 people every year agree with you! There’s no shortage of incredible ways to celebrate or amazing venues in which to tie the knot. 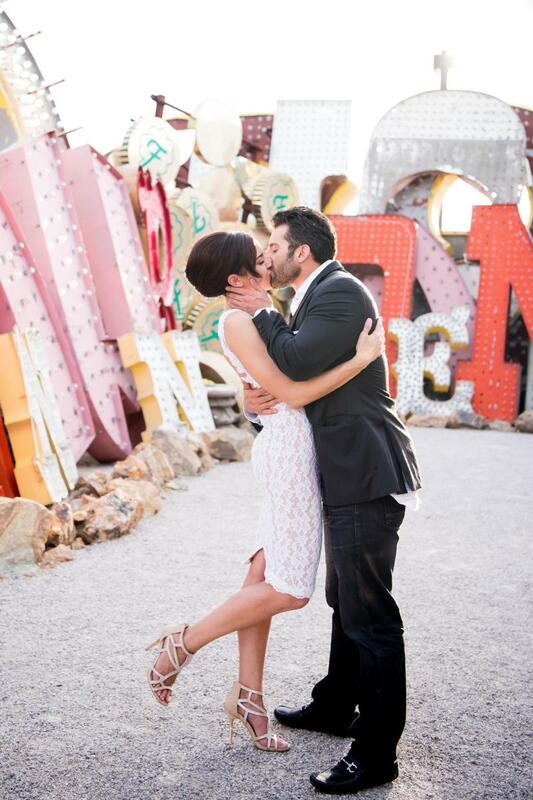 If you’re looking to have a vintage Vegas wedding, you’re in the right place. Nobody does a wedding like Las Vegas. And it all starts with that classic chapel feel. It doesn’t really get any more vintage Vegas than the Little Church of the West. It’s one of the oldest buildings on the Las Vegas Strip and has been doing Las Vegas weddings since 1942. Made of California redwood, the Little Church is where Judy Garland, Cindy Crawford, Angelina Jolie and other celebrities were married. In fact, more celebrities have been married here than any other chapel in the world. Plus, it still has the original light fixtures and lamps – talk about a vintage look and feel. It’s a historic place that’s perfect for your historic day. You don’t have to be royalty to be treated as such. And when you’re at the Royal Wedding Chapel, you’ll certainly feel like royalty. You’ll also feel a deep connection to Las Vegas in the Garden of Love Chapel. The chapel was built around “the Natural Love Tree,” which has been growing strong since the 1940s. Talk about a metaphor for love and putting down roots. 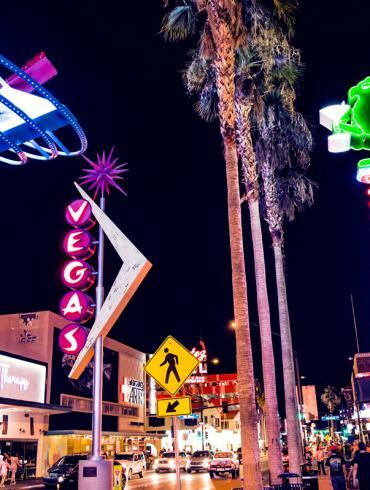 Find all the Vegas charm here, just five minutes from Fremont Street Experience. Once you’ve found the perfect chapel, it’s time to plan the party. With so much to do downtown, the wedding party never has to end. This is vintage Vegas dining at its finest. Have your rehearsal or wedding dinner here and feel connected to the city you’re getting married in. Sit back and drink in the atmosphere. Then, get ready for an incredible dining experience. Looking for a place to have a reception you’ll never forget? 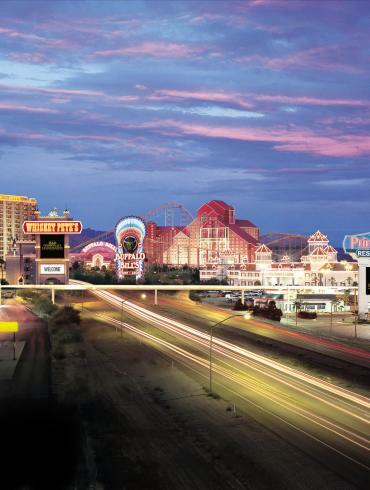 Try the Neon Museum, where larger-than-life signs of Vegas past find a new home. It’s charming and literally has something vintage in every corner. Ever seen a wedding party on pedals? You could. With the RTC Bike Share, you’ve got a completely unique way to get around downtown. Nobody will forget the time they biked from the chapel to the after-party. You could even give your bike a vintage touch with a just married sign, strings and cans. “Here comes the bride on her bike share ride.” It’s kind of catchy. Think of it like a big adult playground, where fun, games, cocktails and nightlife come together to create one big party that you’ll never forget. It features an outdoor courtyard known as the “Backyard,” with a variety of activities including oversized games, four square, fire pits, live music and a bar. Reserve space or just show up. Think of it like a reception with you and hundreds of friends you haven’t met yet. 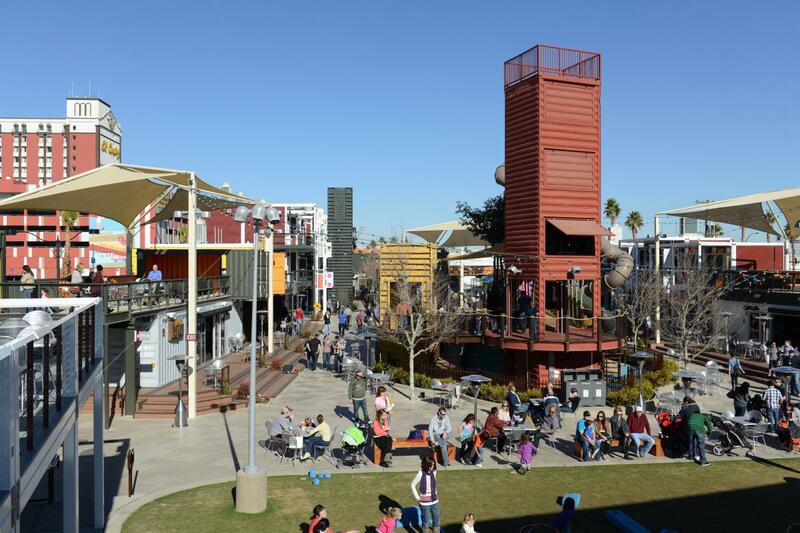 There are so many places to eat, drink and party at the Downtown Container Park. From Big Ern’s BBQ, which offers real deal slow smoked BBQ with fresh sides made from scratch, to JinJu Chocolates, which offers delectable chocolates with a modern twist sure to melt in your guest’s mouth. Everybody in your wedding party can find something to satisfy their cravings. Be on the lookout for free live music every weekend. It’s like having your own band at your wedding. At the end of your big day, there’s no better way to celebrate than in a classic Vegas hotel. Consider these three mainstays downtown, and keep the party going where it started all these years ago. It’s the longest continuously running hotel and casino in Las Vegas and it still boasts the same classic façade it’s had since 1952. Some people call it the cornerstone of downtown. You can call it home for the best night of your life. Stop by The Parlour Bar, get a massage and then grab a bite to eat at Siegel’s 1941. You might even be lucky enough to stay in the same room that Ellie Goulding filmed her music video On My Mind. When you think of downtown, you’ve got to think Golden Nugget. Built in 1946, this hotel and casino has history. Get a taste of the past and the future at the same time. Stop by the Ice Bar for a drink or slide down a world-class, one-of-a-kind waterslide through a shark tank. Then, take your pick from a Fremont Street nightclub to a sophisticated lounge scene. The party never has to stop at the Golden Nugget. You’ll love waking up at the Downtown Grand, where, after a very busy day, you can walk up to the rooftop and relax at the Citrus Grand Pool Deck. Grab a bite to eat poolside and a cocktail, and then soak up that desert sun. You just had the best weekend of your life. So, now you’ve got a start on planning the perfect day. And, whether you choose to go vintage or modern, Las Vegas has everything you need to make wedding memories that will last a lifetime. Just like your love. To get even more wedding inspiration, just keep scrolling.